If you are here looking for stats or metrics, sorry, I can’t help. Truth is I don’t have money to afford to buy the third party software to allow that. But also is I really could care less about the numbers. Actions can’t be captured in numbers. How do you measure a country changing policy? 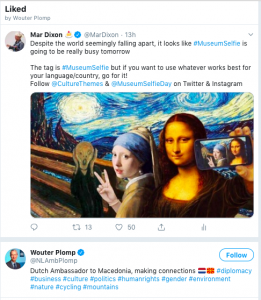 When talking about impact, I was amazed to hear Turkey lifted a ban on selfies in over 300 museums and sites specifically around #MuseumSelfieDay. Turkey on Wednesday marked “Museum Selfie Day” by allowing photo taking in more than 300 museums and ancient sites across the country for the first time. Responding to the calls by the Ministry of Culture and Tourism, Turks flooded into museums to snap a selfie with their favorite exhibits and posted them with the hashtag “#MuseumSelfieDay,” as the ban on selfies was lifted for the entire day. And then a small town in Hungary contacted me to say they were going to be on the News and that it made such a difference to them – that is an impact I can’t measure! But who’s really being snobbish here? Sure, there are some who may think that the unwashed masses should not sully the sacred spaces of a museum. What can be more snobbish, though, than the idea that “ordinary people” can only be enticed towards culture through gimmicks or by turning art into entertainment? There’s a kind of condescension that suggests that only we – the learned middle class – can truly appreciate art for what it is. Everyone else needs entertainment. Every year I think it might be the last year for the day. 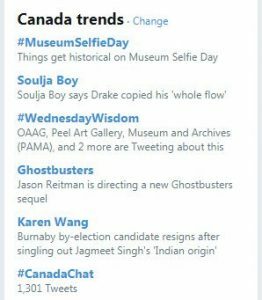 But it’s clear that now more than ever, people need/want an excuse for fun in Museums. Follow CultureThemes.com for our monthly hashtags to how you can get involved!